Auto hide Unity Launcher in Ubuntu 12.04 "Precise Pangolin"
Well I’m almost a week into my return to Ubuntu and there are a few more tweaks that I’ve discovered I like to make. One of these is auto-hiding the Unity Launcher bar along the left side of the display. Perhaps it’s based on doing the same thing with my OS X installation on my MacBook. 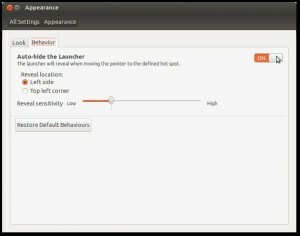 Whatever the reason, this article will outline how to auto-hide the Unity Launcher in Ubuntu 12.04 “Precise Pangolin”. To customize the behavior of your Unity Launcher, navigate your way to the System Settings application and select “Appearance“. From there select the “Behavior” tab, and toggle the button on the right for the option “Auto-hide the Launcher“. You’re then able to customize the reveal location and reveal sensitivity. To customize the reveal location you’re able to decide between the left-side of the screen or the top-left corner of the screen. I prefer the left-side personally. I’ve also left the reveal sensitivity at the default, but you may prefer to tune that to your preference. You can always return the behavior to the default settings by selecting the “Restore Default Behavior” button. Mine seems to work backwards: when Auto-hide is “on” the launcher is always present, I can’t get rid of it, it even overlays apps. When Auto-hide is “off” the launcher never appears and I can’t get it back by moving the cursor into the hotspot. Help.